Messaging is the next big thing...even though it never left. Sending text messages over a decade ago, I wouldn't have predicted that messaging in 2016 (and beyond) would be seen as the future of connection and engagement. When Quartz's news app  was released last week, I decided to download it to see if it lived up to the hype. With an "old is new" interface, the QZ news app acts like a friend that's sending you messages that are in fact small snippets of news. 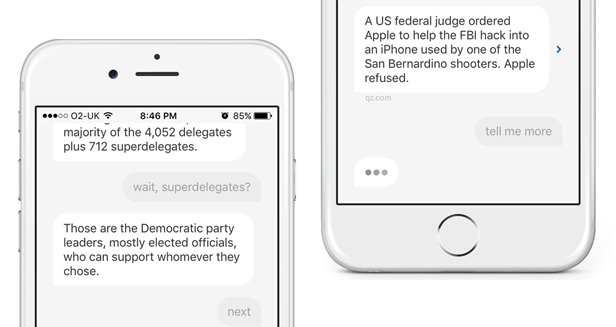 If you want to know more about a particular news item, you respond to a prompt, and a follow-up "message" is sent to the app. It's particularly novel in that it is an enticing way to catch up on news when on the go. If you follow Mark Zuckerberg  on Facebook, you're treated to a wide variety of personal and professional posts. Last month "Zuck" shared a community update  about Facebook and it's growing empire of digital channels. The big takeaway from this social media stats bonanza (the WhatsApp stat has been updated) was that while Facebook is massive, WhatsApp and Messenger are even larger in scope/use. In 2020, it is predicted that WhatsApp will have 2 billion active users . 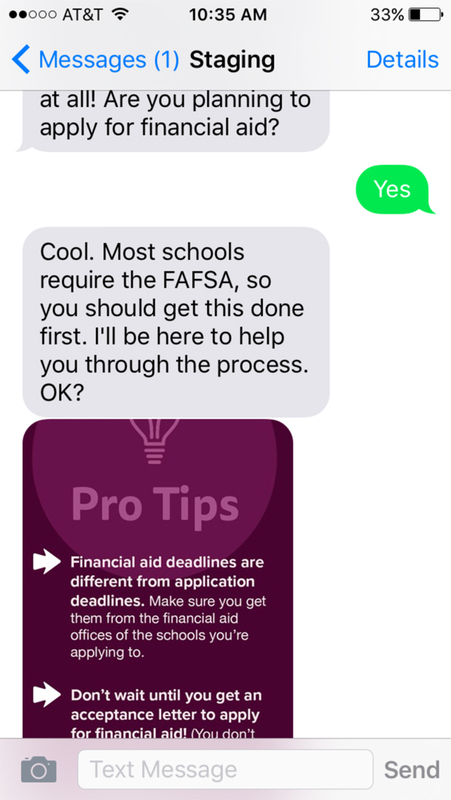 This week I was contacted by a startup that specializes in automated text messaging bots that can answer basic questions and connect students with actual humans. Billed as using "artificial intelligence," AdmitHub 's "Oli" helps students ("several thousand in the U.S.") with tasks like orientation sign-ups, FAFSA assistance, parking permit applications, and initial contact with academic advisors. Founded a year and a half ago, "AdmitHub served over 500 institutions via SMS-based inquiry registration at college fairs this past fall," according to co-founder Kirk Daulerio. 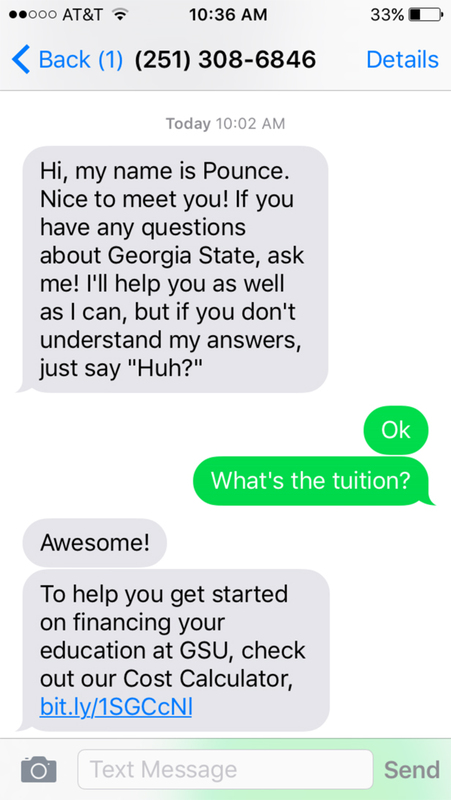 Launching in a few weeks, AdmitHub is partnering with Georgia State University on a custom text-bot called "Pounce." Marketed to student affairs / enrollment management practitioners as a way to "supercharge university EM efforts with stronger personalized engagement," the AI running Pounce is what matters. For AdmitHub to be successful (similar to the QZ news app) students will need to receive accurate, timely, and captivating content in order to continue interacting with the branded bot. According to Daulerio, AdmitHub plans on expanding their automated bot service into "other messaging platforms like Facebook Messenger, Twitter, WeChat, and WhatsApp." Messaging lives on . 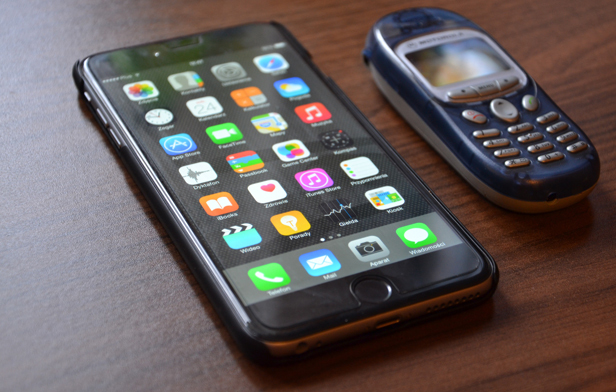 Regardless of innovation and iteration, we keep getting better at improving our simplest form of mobile communication. It is the old-school coolness that hasn't lost its appeal. Messaging seems to be the future of mobile connection, engagement, and communication. Last week, I asked more than 100 students at a UK college what apps they used the most. WhatsApp was by far the most popular app...followed closely by Snapchat, Facebook, Instagram, and Twitter.